Dimensional letters are designed to hook on to specialty sign tracking. Their wide stroke and matte finish make them very easy to read and draw lots of attention to your sign. Other colors, sizes, and additional dimensional letters may be available upon request. To install the letters use the Mechanical Hand “fingers” changer pole on the top of the letter and firmly pull downward to “set” the letter in place. The tapered slot will bind and hold the letters securely in all kinds of weather conditions. Durable – Outdoor grade, high impact plastic. This plastic, changeable sign letter is designed must be used with slotted letter track and slotted letter arms (pictured at left). 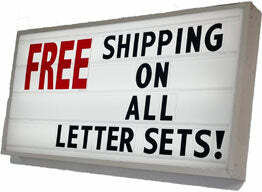 These specially designed letter arms allow you to hook the letters onto the track from the safety of solid ground. Don't risk it! Never use a ladder to change your sign message. Plasti-Bar is a clear extruded high impact acrylic track used to mount slotted and dimensional changeable letters. This track comes in four lengths: 6 ft, 8 ft, 10 ft, and 12 ft.